A new approach for the instant quantitative determination of impurities of materials was developed by Appealing Products, Inc. Disposable Cards, ChemSense QuantTabs™. 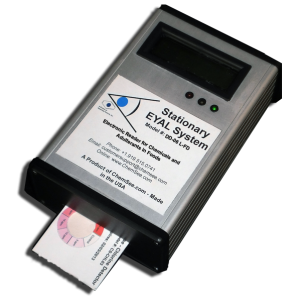 The QuantTab™ Determination Cards are small disposable cards which change ther color when a droplet of test solution with the analyte touches their sensing element. 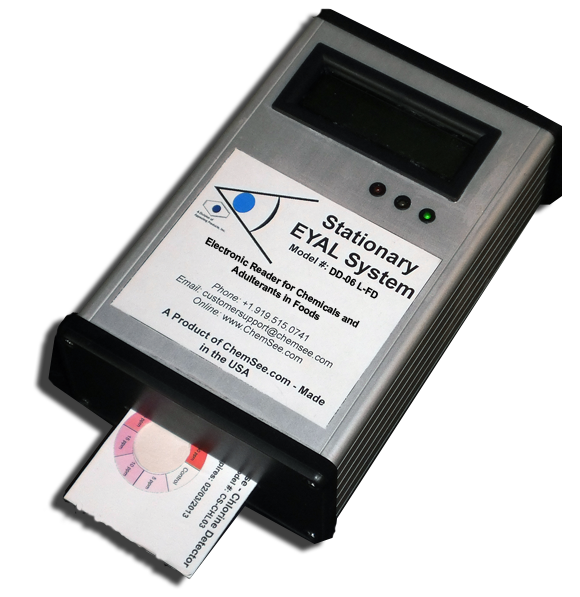 Electronic Reader, EYAL™ DD-06L-C. The electronic reader works with ChemSee’s full range of ChemSense QuantTab™ Cards, allowing for quantitative analysis of the contaminate. The electronic reader looks at the color change and quantifies the color formed on the ChemSense QuantTab™. The signal from the reader is fed into a computer with the proper software. A Computer, which can be any Windows desktop PC or laptop that the software can be downloaded to. This component is sold separately. Software Package which is unique to the analyte being determined. The software converts the reading into a quantitative measure of the concentration, displays it on the reader and on the computer and stores the data for subsequent analysis. The QuantTab™ Determination Cards utilize proprietary dry chemistry to quantify analytes in solution. A typical application may be the adulterants in food. An example of the use of the ChemSense QuantTab™ for the determination of free chlorine in a sample is shown below. A wide range of ChemSense QuantTab™ Determination Cards are available for specific food adulterants. 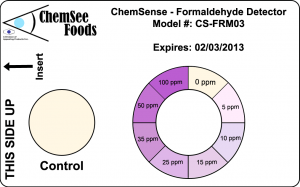 ChemSense QuantTab™ Determination Cards are now avlaible for illegal food colorants. These include QuantTab™ Cards for Analine Yellow, Methyl Yellow, Rhodamine B as well as others. 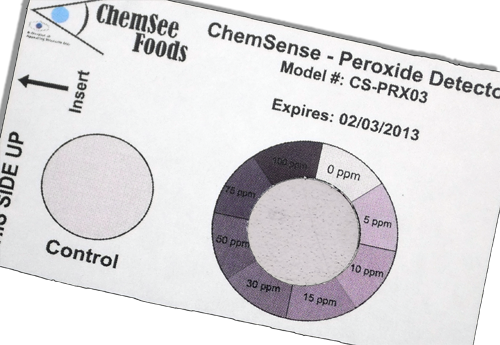 New ChemSense QuantTab™ Determination Cards are being developed and added daily. If you have a need for the determination of a specific analyte, please let us know and we shall be happy and try to accommodate it. Ideal for Instant Testing for Specific Adulterants. A wide range of detectors are available for specific food adulterants. The ChemSense QuantTab Determination Cards are small and lightweight (about the size of a business card). ChemSee’s EYAL™ DD-06L-C Electronic Reader is used to accurately quantify, record and track the concentration of adulterants in a sample. Different software packages are required for the quantification, archiving and analysis of each type of analyte.